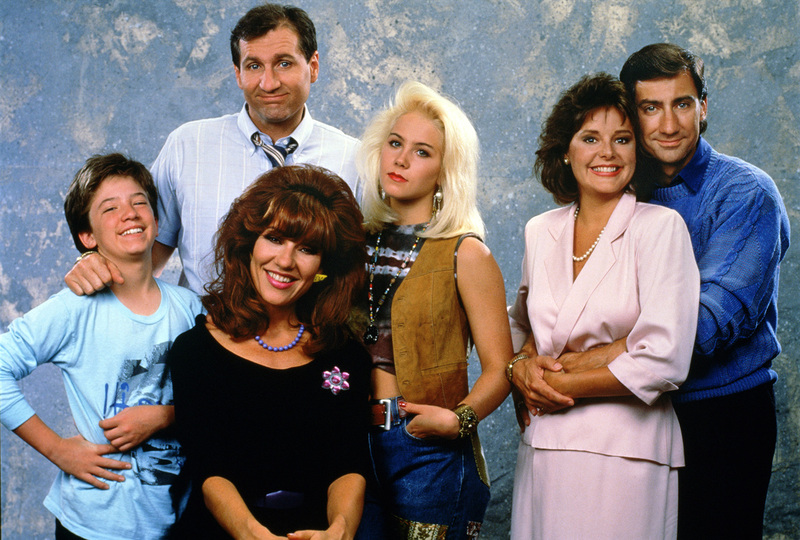 Married..With Children is coming to getTV Monday, September 17! Four episodes will air in primetime every weeknight starting at 8 pm ET, with an additional hour every morning at 9 am (before Peg Bundy wakes up) and late nights at 1 am (after Al Bundy has conked out on the couch). For eleven seasons and 259 episodes, the Bundys generated big laughs and bigger controversy as the series pushed envelopes and subverted sitcom tropes. There was no infallible father, nurturing mother, obedient children, or life lessons. In Married…With Children, everybody is a mess. It’s kind of like real life — just with a studio audience. Ed O’Neill (Modern Family) stars as Al Bundy, Chicago shoe salesman and put-upon patriarch. Katey Sagal (Sons Of Anarchy) is Peg, his love-hungry, bonbon-addicted, high school sweetheart wife. Christina Applegate (Bad Moms) is Kelly, their beautiful but not-very-bright daughter. David Faustino is their son Bud, a wannabe stud who’s mostly a dud. Amanda Bearse plays Marcy, the sweet next-door neighbor who sours under the Bundy’s toxic influence. David Garrison is her first husband Steve Rhoades and Ted McGinley plays Jefferson D’Arcy, Marcy’s often-unemployed second hubby/gigolo. You can see for yourself when the Bundys join the getTV lineup on September 17. Here are some fun facts about the family at 9764 Jeopardy Lane and the now-iconic actors who portray them. 1. Married…With Children was created by Norman Lear alums. Married… co-creator Michael G. Moye began his TV career at age 23 on Lear’s Good Times, writing nine episodes during the show’s last two seasons. He went on to write for Sanford starring Redd Foxx and to write and produce The Jeffersons from 1979 until 1984. He and co-creator Ron Leavitt (also a Jeffersons veteran) developed Silver Spoons in 1982 and created its spinoff It’s Your Move in 1984. The latter co-starred David Garrison, whom they would cast two years later on Married. 2. The co-creator’s wife suggested Katey Sagal as Peg. 3. There was a different Kelly and Bud in the pilot. Two different actors were originally cast as the Bundy kids. Kelly was first played by brunette Tina Caspary, who had worked with Leavitt and Moye on Silver Spoons. Bud was played by blonde-haired Hunter Carson, the son of actress Karen Black. Carson was almost two years younger than Faustino, while Caspary was nearly a year older than Applegate. The pilot was re-shot with Faustino and Applegate and aired on April 5, 1987. 4. Ed O’Neil was the last lead actor to be hired. 5. O’Neill based Al Bundy on his uncle. “Most of the guys that read for it were doing it like Jackie Gleason in The Honeymooners: yelling and mad,” O’Neill said on The Rich Eisen Show in 2016. O’Neill based his concept for Al on his real-life uncle . “My uncle was resigned that life was going to be bad,” O’Neill said. He added that then-Fox chairman and C.E.O Barry Diller loved Sagal as Peggy, but thought they could do “a hell of a lot better” than O’Neill for Al. 6. Married… wasn’t available nationwide at launch. 7. The show was controversial from the start. “The powers that be at Fox at the time hated the show,” Moye said. “This was not the kind of show that they wanted to be the flagship.” In season three, the show was hit with a headline-grabbing boycott by anti-obscenity activist Terry Rakolta. While the protest briefly spooked some advertisers and increased Fox’s use of their censorship powers, it ultimately brought in far more viewers than it scared off. Viewership doubled that season, and the show jumped from a dismal 116th in the ratings to 48th. 8. There was a spin-off. Or two. In season five we meet Al’s friend Charlie Verducci (Joseph Bologna) and his handsome but dim son Vinnie (Matt LeBlanc, pre-Friends). Three shows later, in honor of the series’ 100th episode, the Verduccis got a “backdoor” pilot for what became the show’s only spinoff (at least so far). Created by Leavitt and Arthur Silver, Top Of The Heap debuted a week later co-starring Rita Moreno and Joey Lauren Adams (who had also appeared on Married). It was cancelled after six episodes but revived a year later as Vinnie & Bobby, which was also cancelled just as quickly. 9. It never won an Emmy. More than 30 years after its debut, Married… remains one of the longest running shows in network history to never win an Emmy. Shockingly, none of the actors were even nominated. And O’Neill and Sagal are still without Emmys today (though he’s been nominated three times for Modern Family). 10. Amanda Bearse became a director. Bearse made her directorial debut in season six and went on to helm 30 more episodes over the next five seasons. Since then, she’s directed episodes of Madtv, Reba, and Dharma & Greg. She also directed two episodes of Christina Applegate’s series Jessie. 11. Bonus! There have been at least nine reboots. Married… has such a durable concept that the show has been rebooted in multiple international versions. The Russian adaptation Happy Together is the longest-running to-date, with 364 episodes produced between 2006–2013. Other remakes include: Armenia’s The Azizyans (2016–current); Bulgaria’s ingeniously titled Married With Children In Bulgaria (2012–present); Croatia’s Bracne Vode (2008–09); Hungary’s A Gruesomely Decent Family In Budapest (2006); the U.K.’s Married For Life (1996); Argentina’s Casados con Hijos (2005–07); Brazil’s The War Of The Pintos (1999); and Germany’s Hilfe, meine Familie spinnt (1993). All use the original American scripts, translated into the local language. The longer-running reboots also include new stories and situations, which means there's a Bundy multi-verse with different Al Bundys doing different things across the world! 12. Bonus! There was a reunion. Actually, many reunions. Since Fox divorced Married… in 1997, the cast has reunited frequently. Faustino guest starred on Applegate’s Jessie in 1998. Bearse and Garrison reprised their roles of Marcy and Steve on Nikki in 2001. The entire cast reconvened for a retrospective on Fox in 2003. O’Neill re-teamed with Sagal on 8 Simple Rules in 2004. O’Neill, Sagal, and Applegate guest starred on Faustino’s series Star-ving in 2009. And the four Bundys reunited for the Fox 25th anniversary special in 2012 and for the dedication of O’Neill’s star on the Hollywood Walk of Fame (in front of a shoe store, naturally). Faustino has also pitched a revival, saying his castmates are “all in” but indicating there are “legal issues.” After 30 years, we’ve learned never to count the Bundy family out. Married…With Children joins the getTV lineup September 17. Four episodes air weekdays in primetime starting at 8 pm ET with two additional shows at 9 am ET and 1 am ET. For more, visit the getTV schedule.